The Climate Resilient Flood Management Practices in Georgia project aims to make highly vulnerable communities and regions resilient to climate related hazards such as floods and flash floods. The Adaptation Fund-financed initiative takes an integrated and comprehensive approach by addressing critical gaps in land use policy and regulatory frameworks, which are fundamental to climate resilient flood management. Since childhood my imaginary happy place was always a small house in the mountains besides a river. I am still thinking of that magical place today even as I grapple with traffic jams, urban noise and deadlines. When I go to this happy place, sometimes I’ll add a few details: a little schoolhouse for my daughter, a farm where we can grow fruit... Essential elements for a truly happy place. But being a Mom, and therefore a consummate worrier, I know that rivers aren’t safe places. Flash floods wipe away homes. River banks rise and wash away the harvest we worked so hard to protect. And sometimes, in the worst-case scenarios, lives are lost, dreams are dashed and those happy places transform as if instantly to places of sorrow. This year during an assessment mission to Georgia, I found what just might be my dream-come-true happy place. There on the banks of the Tskhenistskali River in the Rioni Basin, I saw a postcard-perfect white school building facing the water. Looking up through the valley, you could see fruit gardens, bucolic villages and the type of pastoral beauty that belongs only in impressionist paintings and travel brochures. But beauty comes at a cost. In 2005 these very villages were hit by a strong flood that destroyed the fruit gardens and roads, and came so close to the school that it was only through sheer luck that the kids where not hurt - the disaster broke during the night when the kids were in their homes. For the more than 200,000 people living and working in Georgia’s Rioni River Basin, the risk of floods and flash floods has been on the rise, with the other extreme weather events such as landslides, wind and hail storms, snow avalanches and droughts, making this an increasingly dangerous place to raise a family. Climate change has been driving the rise in frequency and velocity of these hard-to-manage weather-related disasters for the people of the Rioni Basin. Intense rainfall concentrated in short periods of time and accelerated glacier melting have the potential to generate more runoff. This results in increased flash floods, mudflows and landslides. Increasing air temperatures and reducing annual precipitation have been leading to prolonged droughts. Think of the numbers behind the risks to my happy place. Over the past 21 years, total damages from hydrometeorological hazards in Georgia came to some US$1.2 billion. Of more concern, these hazards took the lives of 152 people. Floods, landslides and mudflows make up the lion’s share of these climate threats (about 60%) and were directly attributed to more than 100 lost lives during this same period. And it’s not just a problem for the people living on the rivers. More than 1.7 million people across Georgia (that’s 40% of the population) including the most vulnerable communities in remote rural and densely populated urban areas are at risk from these types of climatic hazards. Georgia’s Second and Third National Communications to UN Framework Convention on Climate Change and other studies have indicated that these hazards will further increase in frequency, intensity and geographical spread over time and will have significant negative impacts on various sectors, including agriculture, health, critical infrastructure, tourism and the preservation of culture heritage, environment, natural resources and ecosystems. What kind of information about climate would you want to have if you sent your children to school in Tsageri village on the banks of the Tskhenistskali river? When will the next flood come? How strong will it be? How can you protect your family, your house and your farm? Is it safe to stay in this house in future? Does it make sense to build a house for your kids in this valley? 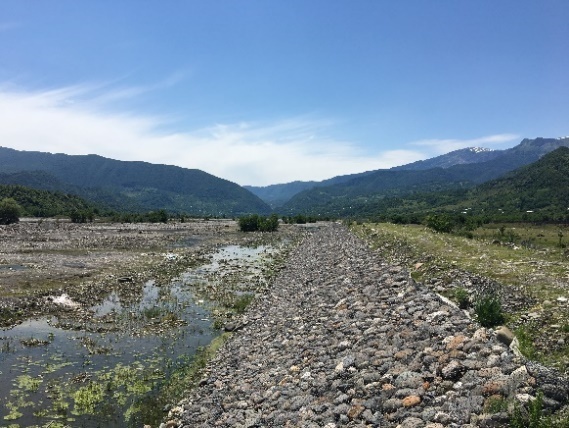 The system of hydro-meteorological monitoring in the Rioni River basin was upgraded with five meteorological stations, 20 meteorological posts , 10 hydrological posts and several landslide monitoring devices. This means that Georgia’s forecasters finally have the data they need to successfully predict floods. A fully-integrated Flood Forecasting and Early Warning System was created with the National Environmental Agency (NEA) of Georgia. NEA staff received training in modelling and operating the system. Today NEA can provide timely and accurate warnings about extreme weather events to the local municipalities and national authorities. Floodplain zoning policy and other policies and tools were developed to enhance flood risk management. The flood plain zoning allows municipalities to guide any infrastructure developments in the floodplain based on accurate flood and landslide risk maps. 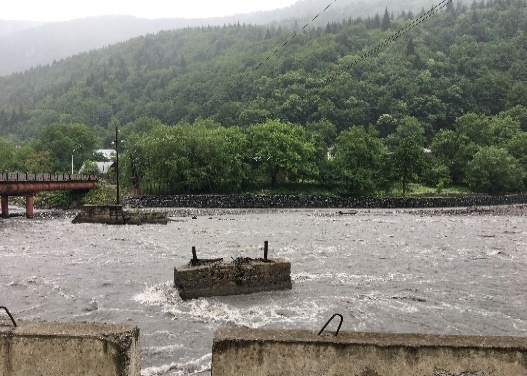 The project included direct flood protection interventions in 12 high-risk areas across six pilot municipalities - four upstream municipalities (Tsageri, Lentekhi, Oni and Ambrolauri) and two downstream municipalities (Samtredia and Tskaltubo). These included reinforcement of river banks with gabions and boulders and agroforestry work. Some 29,000 trees were planted to prevent riverbank erosion – also contributing to greenhouse gas mitigation and capture. Local communities were engaged in planting and maintaining the plantations through the employment guarantee schemes. This means a greener economy, a greener planet and a safer future for the people living in the river basin. For the community of Tsageri village, a new gabion (a protective barrier made from rocks placed in a wire net) shields the village from floods, and allows the farmers using the fertile land of the floodplain for their fruit gardens. The Rioni project enhanced resilience of over 200,000 people in the Rioni River Basin and inspired the Government of Georgia to initiate the development of a nation-wide multi-hazard early warning system to increase resilience of Georgia’s people to the climate change impacts. Natalia Olofinskaya is a UNDP Regional Technical Specialist for Climate Change Adaptation. Follow her on Twitter@n_olofinskaya.